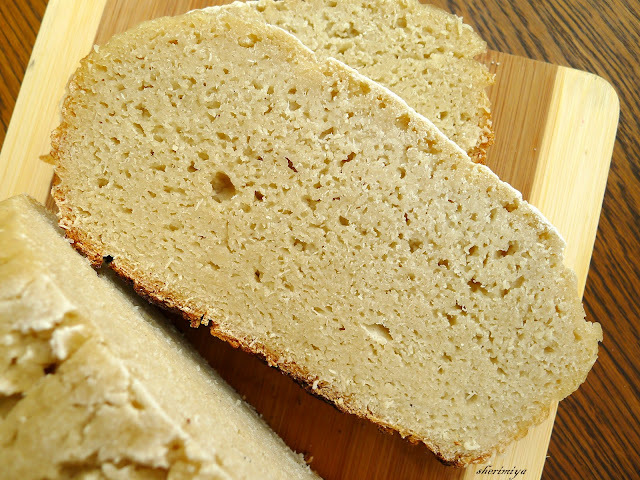 Happy Little Bento: Gluten-Free Adventures: Sourdough! During my gluten-free adventures, I've experimented with several bread recipes and settled on a quick bread that is super convenient and tastes great toasted with peanut butter and jam. I posted about it here. 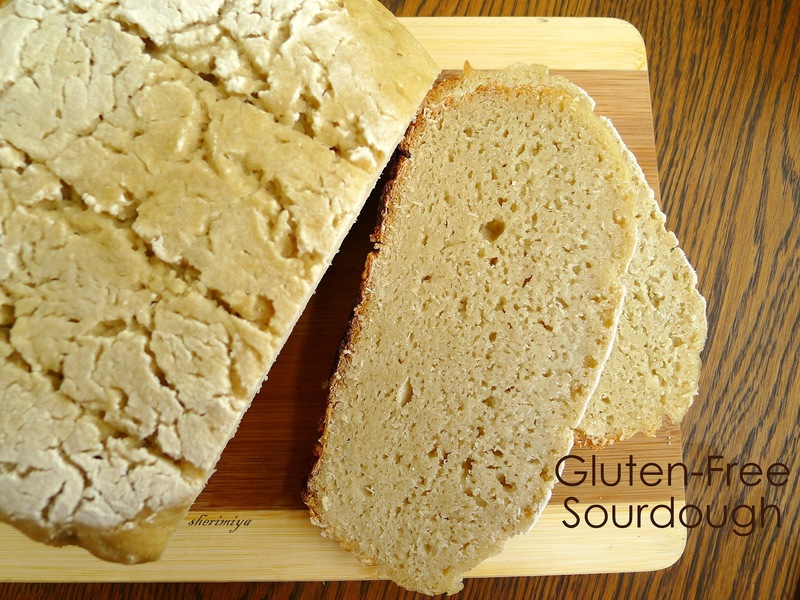 But recently I happened upon a recipe for a gluten-free sourdough, shared by the King Arthur Flour company. As expected, the recipe used King Arthur gluten-free flour mixes and seemed pretty complicated. But my interest was piqued. Sourdough! Without wheat! Is it really possible? Just for the record, I personally LOVE wheat bread, especially gluten-filled, fluffy, chewy sourdough. But out of solidarity for TinySprite, I thought it would be so fantastic if we could all enjoy sourdough together. Now, I've never made sourdough before. In fact, the last yeasted bread I made was many months ago, and I've always used the supermarket-type baker's yeast that comes in those little paper packets. 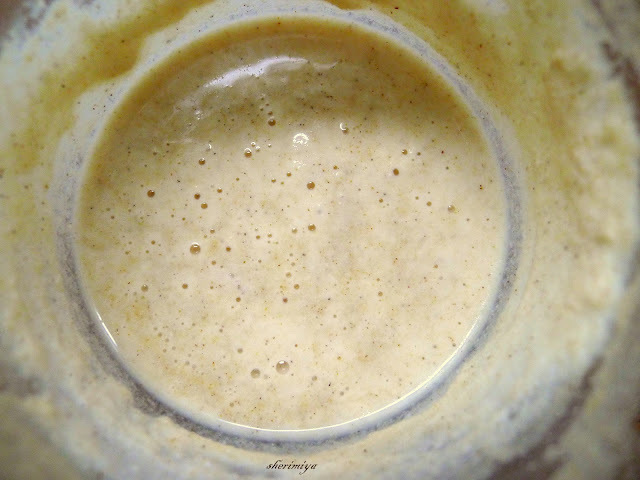 But this recipe got me thinking about making a sourdough with a "wild" starter, that is: using only the yeast and bacteria that are naturally occuring on the flour (or in the air) already. The rationale is that this starter is less robust, requires longer fermentation and therefore results in tangy-er, more sour, more flavorful bread. I was sold on tangy-er. If that's a word. So I tried it. And I made a gluten-free sourdough. And, I liked it! Okay, it's not the sourdough you're thinking of; after all, there's no wheat in it, remember. But the flavor is sour, and the crust is chewy, and even though the crumb is dense rather than fluffy, I'm calling it sourdough. And I want to share it with you. 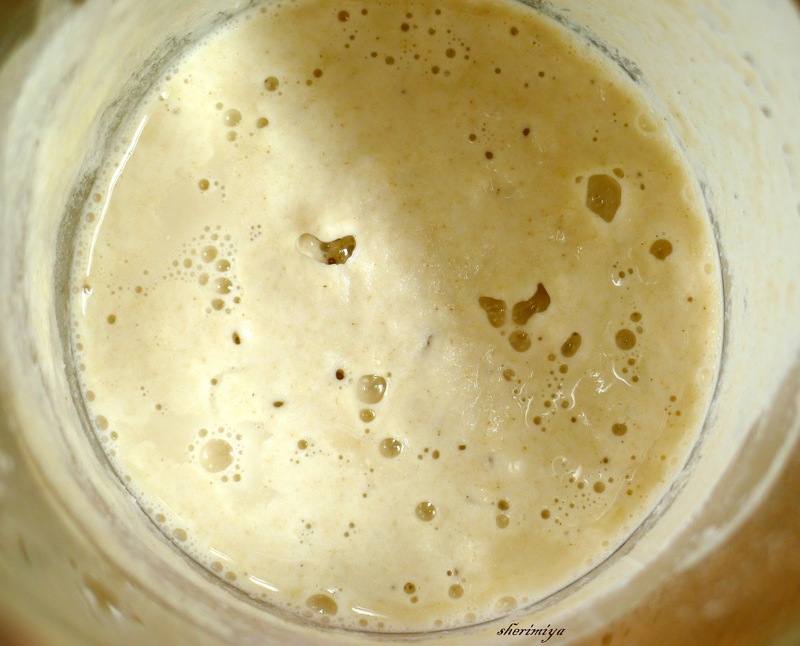 I read a whole bunch of books and articles and recipes on how to make a sourdough starter. And some on making gluten-free sourdough. But there aren't too many on making a gluten-free wild sourdough, so I kind of had to make it up as I went along. First, I used a mixture of brown rice flour, sorghum flour and millet flour. I'm guessing you could use other types too, like garbanzo, quinoa, amaranth, white rice, etc. I measured 2T of flour and added 4T of filtered water. You'll want to make sure the water you use is not chlorinated (later I used bottled water, which also works). I mixed the flour and water together in a small glass cup. Some recipes call for pineapple juice instead of water, reasoning that the added sugar should speed things up. Some others toss in cabbage leaves or grapes to kick off the yeast culture, but I wanted to be purist. I left my cup alone, swirling it every now and then, whenever I walked by it. Honestly, I think I bothered it way too much that first day. Not surprisingly, nothing whatsoever happened the first day that I could tell. The next day, I fed it with 2T more flour and 4T more water. On the 3rd day, I noticed small bubbles. By the 5th day, I was pretty sure I had a nice yeast culture going. And it was totally "wild" -- I didn't add any baker's yeast at all. You can also tell by the smell that something good is growing. It should smell yeasty/beery, like bread dough. Mine kind of smelled vinegary and acidic. The length of time it will take for your culture to get to this point will vary depending on the temperature and humidity of your kitchen, and on your particular yeast and bacteria, of course. Once the culture starts going, it should not become contaminated. You'll get to know how fast and how often it needs to be fed. After a feeding, mine would bubble up a lot, then slow down and completely go flat after about 6 hours or so. 1/4 cup of flour + an equal weight of water every 12-24 hours. At this point, you should be measuring ingredients by weight instead of volume, because this method is much more accurate, especially for baking. By day 10, I had enough for dough. After this point, I neglected to take process pictures (actually I was half afraid it wouldn't turn out -- but mainly I was so frazzled that I didn't have the presence of mind to stop and get the camera at each step. 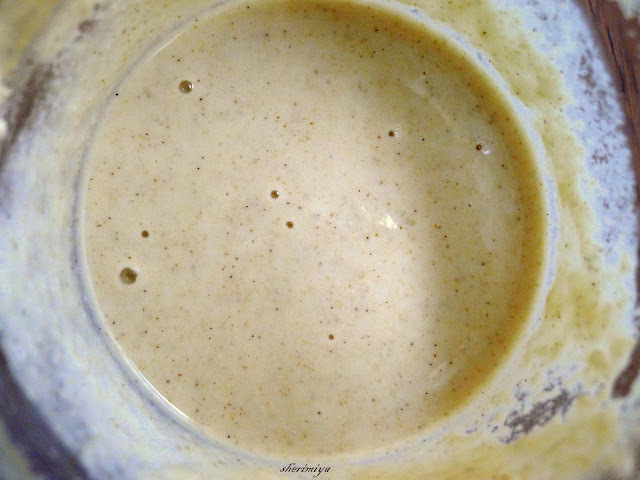 But if you click over to the recipe site I used, you'll see she posted some process photos). I used the recipe I found at The Art of Gluten Free Baking. Now that I'm looking at it, it might seem overwhelming, especially if you haven't baked bread before. But trust me; I think it's probably easier than sourdough made with wheat flour, which you have to work, knead, and rise several times. Gluten-free dough doesn't need that much attention. Basically what you do is add some flour to your starter, some water, salt and sugar. 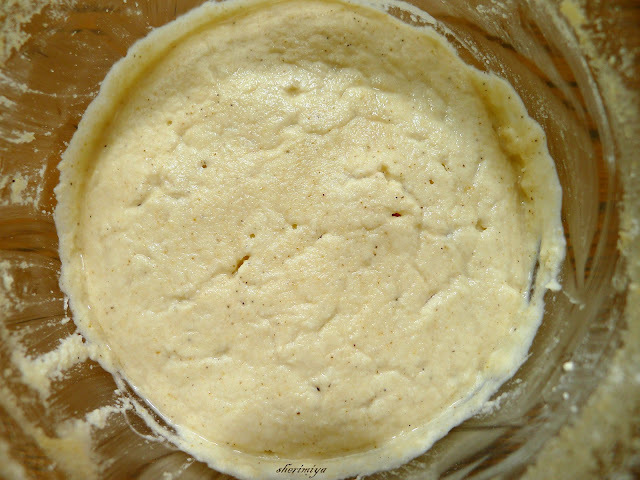 After adding the flour, the dough became very dry and crumbly. If you have an electric mixer and a dough hook, this is a good time to bring it out. I tried mixing by hand, and I don't think I'll do that again next time. Mix, mix, mix. Make sure all the flour is completely hydrated. The consistency should be wetter than what you think bread dough should be like. More like a thick cake batter. Line a non-metal bowl with parchment, pressing the wrinkles out as much as you can so that the bread will pour in smoothly. Pour the dough into the parchment-lined bowl and let it rise for 6-8 hours. If you have a cast iron round French oven, that is ideal. I don't, so I used a Chinese clay pot. It's best if the rising bowl is the same size as the pot you plan to bake in. After the rise, lift out the risen dough by grasping the edges of the parchment paper. Be gentle. The dough should have doubled in size. Carefully place the dough into the preheated pot, cover with the lid and replace into the oven. Bake for 45 minutes covered, then remove the lid. If you have a thermometer, you can check to make sure the internal bread temperature is 200F. Take the pot out of the oven and cool on a rack for 15 minutes before removing the bread. When cool enough, pull the bread out using the parchment, peel off the paper, and admire. Slice and enjoy!